The market streets were the ideal location to trade from and the surrounding businesses complimented the sale of Sainsbury’s goods. Victorian London was the world’s largest city, with 3.2 million inhabitants in 1861. Each year there were more people to feed and so there were plenty of opportunities for new food retailers. The traditional style of trading was through street markets, and these were crowded, busy places. The market streets were the ideal location to trade from and the surrounding businesses complimented the sale of Sainsbury’s goods. The first Sainsbury shops were set up in the busy market streets of Drury lane, Kentish Town, Stepney and Islington. These shops were small, often under 500 square feet. To increase the total sales area, Sainsbury’s therefore traded both through the open windows of the shops and from market stalls set up on the street outside. The outdoor stalls enabled more customers to be served and also provided an advertisement for the goods inside the shop. 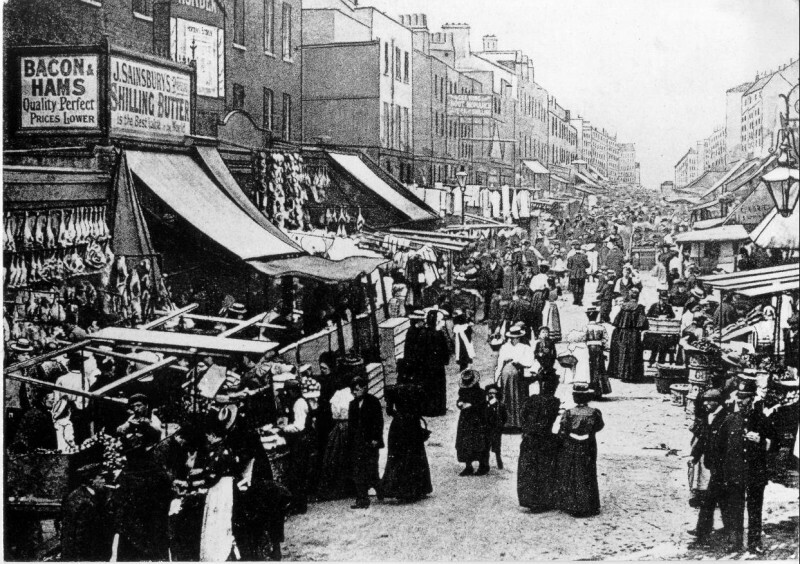 Sainsbury's at Chapel Street market, Islington, 1894. Sites for new stores were carefully chosen, with a central position in a parade selected in preference to a corner shop. John James Sainsbury had pronounced that ‘corners are for banks’. Shops within a row were easier to keep cool and clean that corner sites, which had more windows and tended to collect dust from vehicles as they turned the corner. During the 1930’s whole new shopping parades were built by Sainsbury’s own development company, Cheyne Investments Ltd. Parades were built by at Kenton, Wembley, Ruislip and Haywards Heath with the aim of providing ‘a complete market’ of complementary businesses. 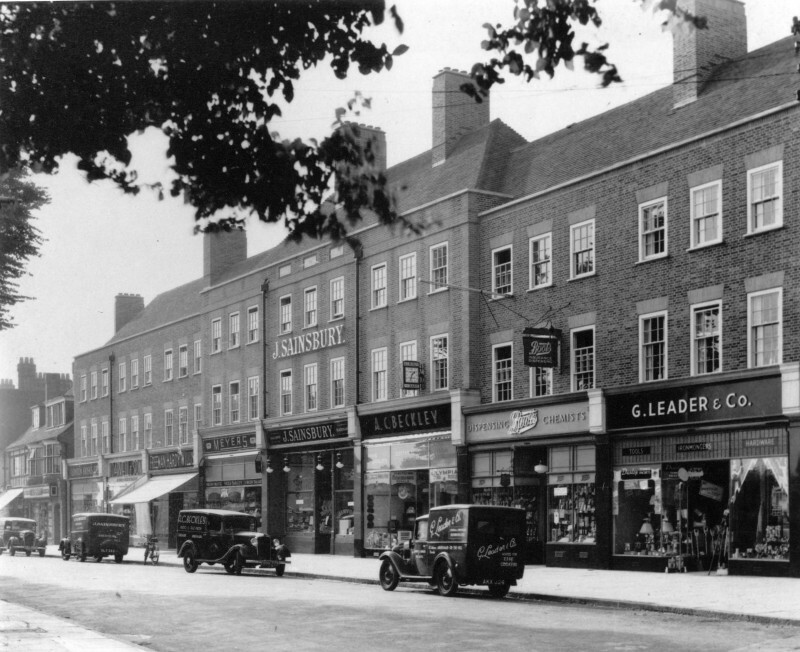 Sainsbury’s advertised its store at Windmill Hill, Enfield alongside the adjacent Waigh Brothers greengrocers and Delforce Brothers fishmongers as ‘three good shops all in a row’. Chiltern parade in Amersham was built by Sainsbury’s in 1937. Sainsbury’s occupied the central shop, while others were occupied by a newsagent’s, a shoe shop, a greengrocer’s, a gentlemen’s outfitters, a branch of Boots and a milliners. The interwar period was a time of great building enterprise and other developers knew that a Sainsbury’s shop in their parade would attract other traders. John Benjamin Sainsbury took an active role in choosing sites for new Sainsbury store. He took his family to look for sites in greenfield areas at weekends and visited potential new locations to make sure they were busy enough. It would sometimes take years to find the perfect location for a new store, but once a location had been found the design and building of shops was so rapid that designs for different locations were ‘twinned’ as in the shopping parades at Morden and Gerrards Cross. In contrast to the construction boom of the 1920s and 1930s, there were severe restrictions on new building in the years following the Second World War. It was not until 1950 that Sainsbury’s was able to begin modernizing its existing stores, first at Selsdon, then with the first self-service store at London Road, Croydon. Licenses for new buildings were difficult to obtain and former bomb sites were prioritised for re-building. They were often too small to be ideal but stores were re-built with the new emphasis on technology and cleanliness. The East Grinstead store featured prefabricated chilled counters and air-conditioned preparation rooms. When the shop opened on 18th September 1951 the press described it as ‘the most modern hygienic food shop in the South of England, and possibly in the whole country’. As a part of the post-war plan to re-build Britain, a number of New Towns, ‘Expanded Towns’ and London estates were built. Sainsbury’s opened self-service stores on the first two estates built by the London County Council LCC) to rehouse those made homeless in the Blitz at Debden and Grange Hill in Essex. The store in Debden was the first shop in the New Broadway Parade, on an unmade road. The estate was built on marshland and was so far out in Essex that the store was referred to by the head office staff as ‘Fort Debden’. The new store opened to customers on November 3 1952, providing a mixture of self-service and counter service for goods which were still rationed. Eastbourne shoppers peer into the shop before its opening. The New Towns which were designated by the government from 1946 to provide better quality housing or accommodate ‘overspill’ from London provided important locations for the expansion of Sainsbury’s. During 1957 and 1958 four self-service stores opened in the new towns of Hemel Hempstead, Crawley, Harlow and Stevenage. These stores occupied central positions in the town centre shopping precincts, providing focal point for new town communities. As the concept of self-service shopping took hold during the 1960s and early 1970s, many smaller Sainsbury’s shops were closed down and replaced by larger supermarkets, often in new indoor shopping centres. In 1974, this concept was taken a step further with the opening of the new ‘Sainsbury Centre’ in Sutton Coldfield. This was the first in a series of ‘composite developments’ owned by Sainsbury’s and comprising a six storey car park, a library and five shop as well as a Sainsbury’s supermarket. 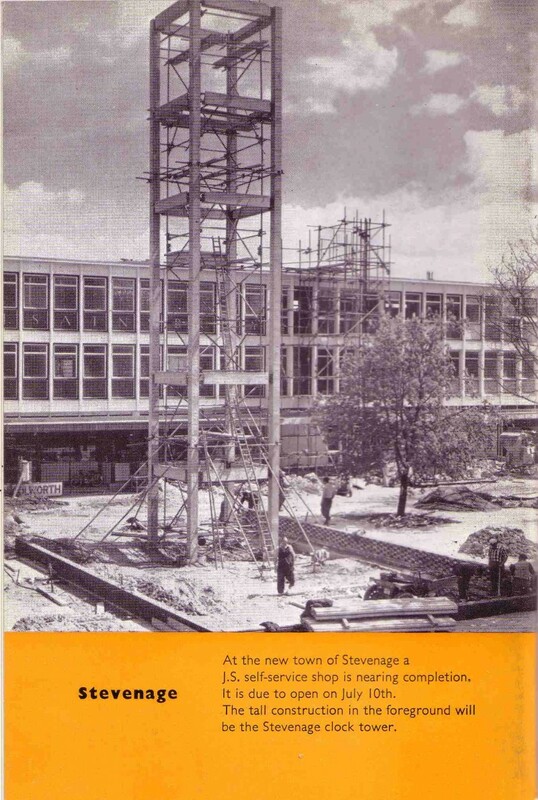 'JS Journal' report on Stevenage, June 1958. The Coldham’s Lane opening was an important development in Sainsbury’s history. It became the first Sainsbury’s to take £1 million in a single week and on two occasions in the 1990s the store had to be closed as it had become dangerously busy. Its popularity highlighted a shift in shopping patterns. With the growing use of cars, customers could easily access more distant locations offered the opportunity for larger stores, which provided more choice for the customer, along with economies of scale for the company. They were therefore both more popular and more profitable than those in cramped high street locations. However, the modern edge-of-town facilities were intended to complement, rather than replace high street shopping. 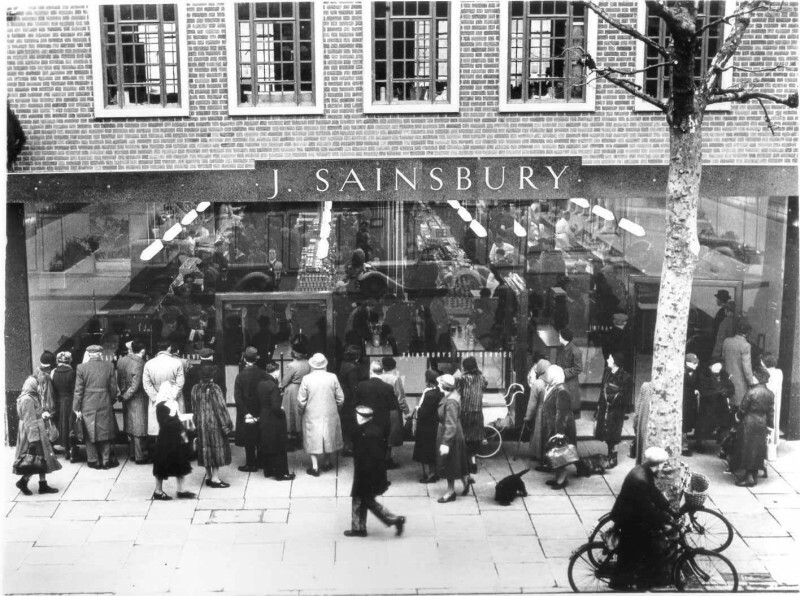 Older high street branches continued to provide an important service in many towns, notably Guildford High Street, where Sainsbury’s counter service shop had opened in 1906 and was converted to self-service in 1962/3. Despite the opening of the large Burpham store on the edge of the town in 1985, the High Street shop continued to trade profitably, and was completely refitted in 1990. Where possible, Sainsbury’s also made use of existing historic buildings on these sites. 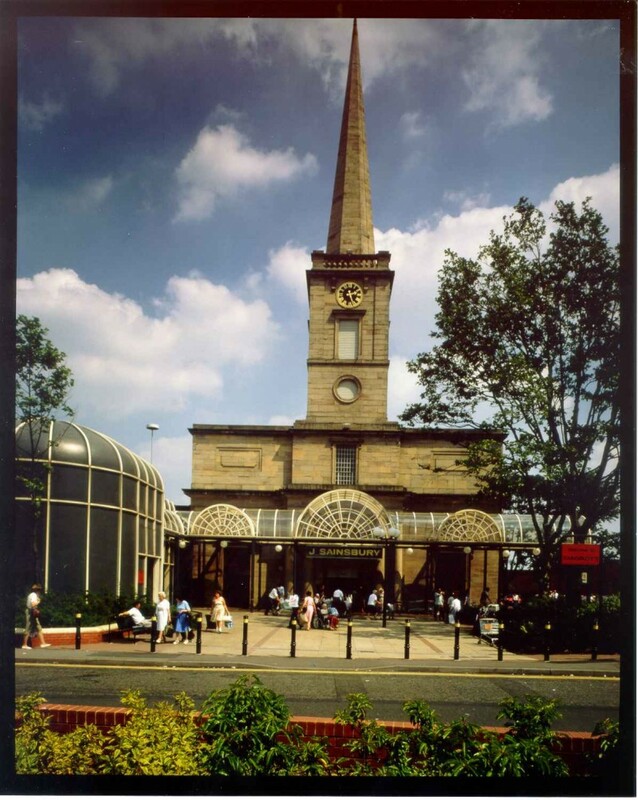 The Wolverhampton branch which opened in 1988 incorporates a disused Victorian church, which now houses the store’s coffee shop. The store in Streatham, South London is built inside the exterior walls of a renovated listed silk mill and adjacent listed building has been restored and used as a day nursery. In 1998, Sainsbury’s piloted its first Local store in Hammersmith. The store opened on the busy Fulham Palace road, and was designed for the convenience of customers who did not have time to do a full food shop. Research showed that people were working longer hours and more women were in employment than ever before. Customers needed to spend less time on chores such as shopping, so local ‘top-up’ shopping was an ideal solution. As well as a large range of ready meals, wines and desserts designed for people on-the-go, the branch also offered hot drinks and freshly baked goods, alongside Sainsbury’s best-selling products. The Hammersmith store also had a cash machine and opened until midnight most days of the week. The Sainsbury’s Local was also groundbreaking in terms of staff training. In most Sainsbury’s stores, colleagues were trained for specific departments. The small size of Sainsbury’s Local stores meant that staff needed a high level of product knowledge across all departments. Keeping in line with the ‘Local’ concept, the Hammersmith store also employed only local people.